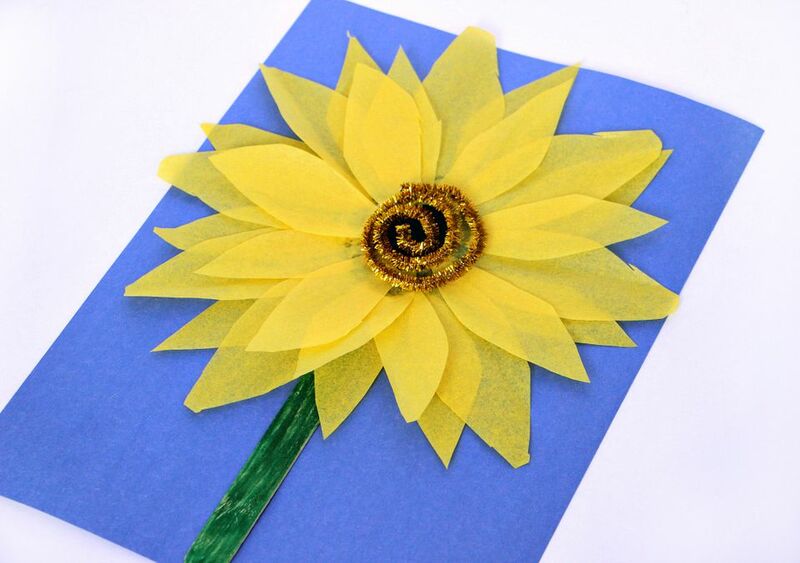 Sunflowers are a classic symbol of summer and sunflower-themed crafts are such fun to make. Kids love doing crafts that replicate things they see in the world, especially something as beautiful and bold as a sunflower. This bright and cheery craft is simple to make–you only need a few basic craft supplies. The results are adorable and something your kids can be really proud of. First, you'll need to gather some basic craft supplies. Anything on this list that you don't have can easily be found at a craft store. First, color your craft stick green. Then, use your scissors to cut out sunflower petals in various sizes from yellow tissue paper. You will want a bunch of them, as each child will layer several onto their craft. We used 20 to 30 petals per sunflower. Let your preschoolers cut them out themselves–using scissors is a great fine motor activity for kids. Glue the colored craft stick onto your construction paper. This will be your stem. Use the black marker to draw a circle, which will be the center of your flower. This point can be used by your kids as a guide for laying their petals. Put glue around your flower center (the black circle). You can use regular white glue–have the kids squeeze out a small circle around the flower center–or you can use a glue stick or white glue and a paintbrush if your kids have a hard time squeezing the bottle. Layer your flower petals around the flower center, adding more glue as needed. Curl a pipe cleaner and glue it to the center of your sunflower. A sparkly gold one is a perfect choice. If you don't have a pipe cleaner don't fret, this sunflower craft looks great even without the pipe cleaner. Display your completed craft on your art wall or fridge. Either way, these sunflowers look so cute.